Figure 1. An intraoperative photograph shows a decompressed C2 nerve root, ganglion and postganglionic nerve during C2 microdecompression (C: spinal cord, G: C2 ganglion, R: C2 nerve root). Occipital neuralgia is a symptom complex of severe pain along the occipital nerve distribution. The pain is located at the juncture of the posterior neck and head. The pain extends up to the upper portion of the posterior head and goes to the temple, forehead, and behind the eyeball. It usually occurs constantly but the severity can vary. The pain can be multifactorial, such as some degree of baseline constant aching, intermittent shooting of severe sharp pain, and band-like dull aching all around the head. Often, patients have a history of whiplash injury, or carry a diagnosis of migraine. Treatments have been focused on symptomatic treatments, because the nature of disease has not been fully understood. Physicians attempted various medical treatments under the assumptive diagnosis of occipital migraine. Symptomatic nerve blocks and steroid injection were given to patients. Dr. Jho believed that most cases of occipital neuralgia were not truly occipital nerve disorders but rather C2 nerve compression syndromes. The occipital nerve is the nerve arising from two nerve roots coming out of the spinal cord such as C2 and C3. C2 and C3 nerve roots join together to become the occipital nerve when these nerves enter between the deep and superficial muscle layers of the neck. Some believed that occipital neuralgia was caused by occipital nerve entrapment at the place where the occipital nerve passes the muscle and fascia layers to reach the posterior head. But historically, surgical decompression treatment at this level where the occipital nerve passes through the muscles and fascia has not been satisfactory. Surgical treatments of various methods of nerve cut at the occipital nerve or next to the spinal cord have been disappointing as well. Despite numbness caused by the nerve-severing surgery, pain usually returns in a few weeks or months after the operation. Dr. Jho believed that this pain syndrome was similar to arm or leg pain syndrome caused by cervical and lumbar nerve impingement. Occipital neuralgia is not caused by occipital nerve entrapment, but rather by encroachment of C2 nerve root and ganglion just next to the spinal cord. Diagnosis can be made by precise C2-selective nerve block under fluoroscopic control. If a C2-selective nerve block relieves pain temporarily while local anesthetic numbs the C2 sensory area, it confirms that the pain syndrome is caused by compression of the C2 nerve root and ganglion. In addition, MR scan of the cervical spine is obtained in order to confirm that patients do not have any other cervical spine disease that can sometimes cause occipital pain. Dr. Jho's C2 decompression operation involves an approximately 2-cm incision at the juncture between the posterior head and neck with decompression of C2 nerve root and ganglion. Decompression of the C2 nerve root and ganglion means that the compression around the nerve root and ganglion (often by vascular compression) is eliminated. This method is based on the idea that this type of pain is similar to that which can occur in lower cervical nerve roots or lumbar nerve roots. Thus the diagnosis is named C-2 radiculopathy instead of occipital neuralgia. 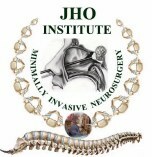 This Jho procedure is innovative because it incorporates a nondestructive philosophy for a poorly defined disorder. The decompression procedure is often done in conjunction with a C-2 marcaine block which acts as a diagnostic test. The surgery is performed under general anesthesia and takes one to two hours. The Jho procedure is usually done on an overnight stay basis. A person who suffers from neck and arm pain from a cervical herniated disc or bony spur is said to have cervical radiculopathy (which means nerve pain). A person who has sharp stabbing pains at the top of the neck and the base of the skull and that radiate into the head may be suffering from C-2 radiculopathy. Instead of radiating into the arm as in a C-6 radiculopathy, C-2 nerve compression causes pain to "shoot" into the head. This is often called "occipital neuralgia". The nerves in the neck that come off of the spinal cord can be compared to electrical cables that originate from a fuse box and travel throughout the house. So rather than performing destructive procedures such as cutting the nerve which leads to numbness, this new innovative procedure addresses the underlying pathophysiology and removes whatever may be pressing on the C-2 nerve root. Rather than cutting the cables when there is an electrical problem somewhere in the house, C-2 microdecompression confronts the problem at the "fuse box". This procedure is indicated for patients with the aforementioned symptoms who also received temporary or partial relief from a C-2 marcaine block, which helps confirm the diagnosis.